This week's star of Born to Shine on the Centre Line is Laetitia Jordaan from Nelspruit in South Africa. I started riding as an adult at the age of 30. After seeing an advert for trail rides through the mountains not far out of town I decided to try, as horse riding is something I had been wanting to do for a long time. I am an accountant, which means being stuck in an office the whole day, and for my colleagues this transition into an outdoors horse person was something they never expected. Where did you find your horse and how long have you been a partnership? Crusader is a 14 year old bay Arab X. We have been together for two and half years. I had placed an advert on Facebook with specifications for what I was looking for (and have been told I should ride by instructors). 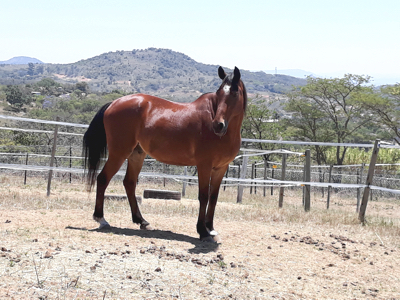 His previous owner answered my advert (a few months after I placed it) and said she had a horse available, although older than I wanted, and sent a photo. Just something in the photo made me decide to go and try him out, and we just clicked from the first moment. Quite a lot, he is a very curious horse, which means there is never a dull moment. The most recent ones are that in a Friday lesson he spooked at someone with an umbrella walking down the road, but the Saturday when we were riding a helicopter flew low enough across the arena to cast a shadow over us and he didn't even bat an eyelid. He also doesn't like bicycles, although there he is picky, the fancy upmarket ones the cyclists ride with doesn't bother him, but old rattling bicycles that the farm workers ride on...... Although he is a gelding he just can't focus on arena work when there is a mare in the paddock next to the arena, he would look at her every time we go past. And he is the reason the tape around the paddocks at our new yard has now been connected to electricity, seems he is a believer that the grass on the other side is greener. What do you want to achieve in 2018? I would love to get my score above 60%. Training my horse for dressage, as he had been a trail horse his entire life, and only in the last two and half years with me has he been doing small shows, mainly poles on the ground at jumping shows. What's your biggest achievement to date? Doing dressage with him when everyone said he will never be a dressage horse (we still need some work but we are getting better). How long have you been a dressage rider? I have only been riding for six years, but have only started focusing on dressage this past year. How did you first hear about competing via Dressage Anywhere? What's your favourite thing about competing via Dressage Anywhere? That I can now finally do dressage shows and not worry about having to travel my horse. Sadly we don't have a lot of dressage shows in my area, only about four a year, and then most of them involve travel. The competition yard I used to stable at did mostly show jumping, with only one dressage show a year. Now I can compete every month, no worries about my horse's safety while traveling, and we can compete in the comfort of our own yard (he travels well but very spooky in strange places). How long have you been competing with us? Since March, and looking forward to doing the veteran classes with him next year. If you'd like to tell us your story and share with other riders, fill out this form and send a photo of your horse to info@dressageanywhere.com.